"Here we are!" Neon has released the official trailer for an indie documentary titled The Biggest Little Farm, which premiered at the Toronto & Telluride Film Festivals last year. It's also playing at the Sundance Film Festival this month, and arriving in theaters this spring. I LOVE this film so much - it all started with a promise they made to their dog. And that hooked me right away (I adore dogs). The Biggest Little Farm is about two dreamers from Los Angeles who decide to give up their city life and invest everything in a farm, challenging themselves to build and maintain a biodynamic farm (meaning it's entirely organic and self-sustaining). This doc chronicles their 7-year journey to build, seed, grow, manage, and maintain the farm, with all kinds of problems arising, and solutions presenting themselves in natural ways. I'm quoted in this trailer which makes me happy because it's the best - read my review. This is a must watch for animal lovers. The Biggest Little Farm follows two dreamers and their beloved dog when they make a choice that takes them out of their tiny L.A. apartment and into the countryside to build one of the most diverse farms of its kind in complete coexistence with nature. The film chronicles their near decade-long attempt to create the utopia they seek, planting 10,000 orchard trees, hundreds of crops, and bringing in animals of every kind– including an unforgettable pig named Emma and her best friend, Greasy the rooster. When the farm’s ecosystem finally begins to reawaken, their plan to create perfect harmony takes a series of wild turns, and to survive they realize they'll have to reach a far greater understanding of the intricacies and wisdom of nature, and of life itself. The Biggest Little Farm is directed by filmmaker John Chester, director of the docs Euphoria, Lost in Woonsocket, and Rock Prophecies previously; who also appears in the film. This premiered at the Toronto and Telluride Film Festivals last fall, and is also playing at Sundance. 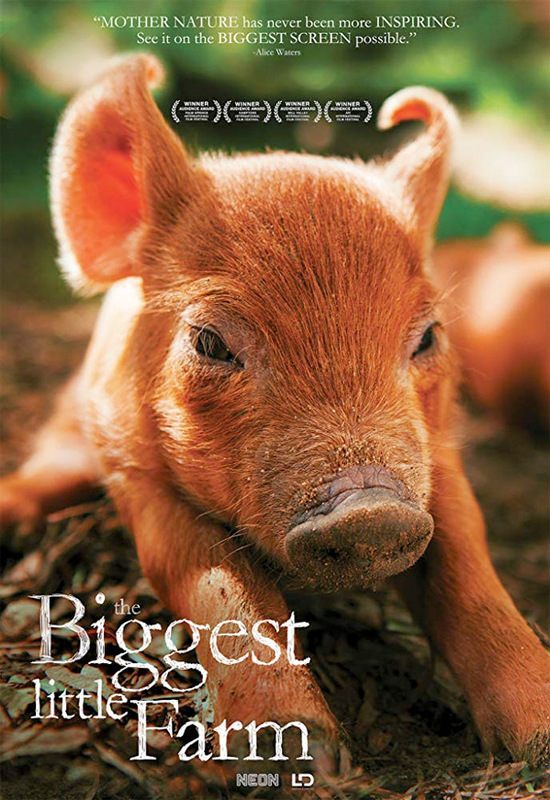 Neon will release Chester's The Biggest Little Farm in select theaters starting May 10th coming this spring.